In 1719, John Todd and Evan Thomas received a land grant within the area that is now the Nauck neighborhood. Robert Alexander later acquired the land. In 1778, Alexander sold his property to John Parke Custis, whereupon the land became part of Custis' Abingdon estate. During the mid-1800s, Gustavus Brown Alexander owned much of the area that became Nauck, which at the time was called Green Valley. African Americans began to purchase property and settle in the Nauck area during that period. Among the early African American property owners were Levi and Sarah Ann Jones. In 1859, the Alexandria, Loudoun and Hampshire Railroad began operating to Vienna from a terminal in old town Alexandria. The rail line, which subsequently became branches of the Richmond and Danville Railroad, the Southern Railway, the Washington and Old Dominion Railway and the Washington and Old Dominion Railroad, eventually reached the town of Bluemont at the base of the Blue Ridge Mountains in 1900. The line, which traveled through the valley of Four Mile Run, had stations named Nauck and (later) Cowdon where it crossed Shirlington Road. Although the line carried freight until it closed in 1968, passenger service through Nauck ended in 1932 during the Great Depression. During the American Civil War, the Union Army constructed Fort Barnard and other fortifications in the area. The army also established there a number of encampments for its troops, as well as a large convalescent camp. After the war ended in 1865, Thornton and Selina Gray, an African American couple that had earlier been slaves at Arlington House, purchased a small piece of property in the area in 1867. During 1874-1875, John D. Nauck, a former Confederate Army soldier who had immigrated from Germany, purchased a 69 acres (28 ha) parcel of land in the area. Nauck, who held at least one political office in the area, lived on his property and subdivided and sold the remainder. During the post-war period, the area attracted several African American families residing in Freedman's Village and other locations. In 1876, William Augustus Rowe, an African American who lived in Freedman's Village and was elected to a number of political positions, was among those who purchased property in the area during that period. In 1885, a “Map of the Town of Nauck, Alexandria County, Virginia" that resulted from an earlier land survey was recorded. Nauck grew slowly during the late nineteenth century. In 1874, a congregation initially organized in Freedman’s Village purchased land in the area on which to relocate a building containing an African Methodist Episcopal Zion Church, the Little Zion Church. The church's building housed a public school that was later known as the Kemper School. In 1885, the Alexandria County school board built a one-room school nearby. The board constructed a new two-story brick school in 1893 at South Lincoln Street. The board later replaced that building with a larger facility that now contains the Drew Model Elementary School. In 1898, the Washington, Arlington & Falls Church Railway constructed a branch of its interurban electric trolley system that began in Rosslyn, connected with lines that traveled to downtown Washington, D.C. and other points, and terminated a short distance north of the Southern Railway's Nauck (Cowdon) station (see: Nauck line (Fort Myer line)). The line paralleled the present South Kenmore Street and stimulated the neighborhood's development. The trolley line's Nauck station was located south of Steuben Street (now 19th Street South). However, the 1902 Virginia Constitution, which established racial segregation throughout the state and restricted the rights of African Americans, stopped the neighborhood's expansion. Property owners continued to subdivide their lands to accommodate more people, but Nauck's boundaries largely remained unchanged. In 1922, the Lomax African Methodist Episcopal Zion Church was constructed on 24th Road South between South Glebe Road (Virginia State Route 120) to the east and Shirlington Road to the west. The church, which is a successor to the Little Zion Church, was added to the National Register of Historic Places in 2004. During World War II, the federal government constructed Paul Dunbar Homes, an 11 acres (4 ha) segregated barracks-style wartime emergency low-income housing community for African Americans. The government built this affordable housing project on a parcel of land at Kemper Road and Shirlington Road that Levi Jones and his family had once owned. Meanwhile, construction of The Pentagon and its surrounding roads during the war destroyed several older African American communities. Some of those communities' displaced residents relocated to Nauck, thus stimulating the neighborhood's development and increasing its African American population. By 1952, few blocks in Nauck were still vacant. Others were built nearly to capacity. The neighborhood continued to develop during the remainder of the 20th century along the lines established many years earlier. In February 2012, a neighborhood resident who had earlier headed the Arlington chapter of the National Association for the Advancement of Colored People (NAACP) circulated a letter that advocated a change in the neighborhood's name from Nauck to Green Valley. The letter claimed that, as John D. Nauck had once served the Confederacy, the neighborhood's name should no longer commemorate his later role in the neighborhood's development. Developers have recently demolished many of Nauck's older houses and replaced them with larger homes because of increases in residential land values that the neighborhood experienced during the 2000s and 2010s. Recent residential redevelopment in the neighborhood has included the construction of the Townes of Shirlington, Shirlington Crest, and The Macedonian, an affordable housing project that tax exempt bonds from the Virginia Housing Development Authority and low-interest loans from the Arlington County government financed. The land along Shirlington Road has been the target of major redevelopment in recent years. In 2004, the Arlington County Board adopted the Nauck Village Center Action Plan. The Action Plan covers the commercial core of Nauck, which is bounded by Glebe Road to the north, the bend in Shirlington Road to the south, and approximately one block east and west of Shirlington Road. In 2011, Walmart expressed an interest in constructing a store near I-395 on Shirlington Road in Nauck. Walmart's plans fell through after the Arlington County Board amended the County's zoning ordinance to require County Board approval of such plans. The Four Mile Run valley, within which the Washington and Old Dominion Railroad traveled through Nauck until 1968, is the last large area in Arlington County that still contains a concentration of properties zoned for industrial uses. In November 2018, the Arlington County Board adopted the Four Mile Run Valley Area Plan. The document addresses a number of planning issues that are intended to guide the future development of the area, including environmental sustainability, open space planning, building height, land use mix, urban design and transportation systems. In 2013, the Arlington County Board designated the Green Valley Pharmacy in Nauck as a local historic district. In 2014, the County's government held an unveiling ceremony for a historical marker that it had recently erected at the Pharmacy's site. Nauck Park, located at 2551 19th Street South, offers the neighborhood 0.32 acres (0.1 ha) of recreational space. The park contains restrooms, picnic tables and a school-age playground. Drew Park is located at 2310 South Kenmore Street, adjacent to the Charles Drew Community Center. The park contains a playground, a basketball court, a baseball diamond and a sprayground. Fort Barnard Park, located at 2101 South Pollard Street, occupies 5 acres (2.0 ha) of space near the Fort Barnard Community Garden. The park is across the street from the Fort Barnard Dog Park. The park has “fort”-themed play equipment, a mosaic and a hopscotch area. The park also contains a playground, picnic shelter, a baseball diamond and a basketball court. The park is located at the former site of Fort Barnard, a redoubt that the Union Army constructed during the autumn of 1861. The fortification, which was on the Arlington Line of forts, was an early component of the Civil War Defenses of Washington. Park landscaping has destroyed the last remnants of the fort. Fort Barnard Heights Park, located at 2452 South Oakland Street, occupies 0.1 acres (0.040 ha). The park contains a picnic table, benches and open green space. The Arlington County government has designated as "Four Mile Run Valley Park" an open space that contains Four Mile Run, the stream's riparian zones, and adjacent areas. The Valley Park straddles the southern border of the Nauck neighborhood. Two components of the Valley Park (Jennie Dean Park and the Shirlington Dog Park) are within Nauck. In September 2018, the Arlington County Board adopted a master plan and design guidelines for the Valley Park. Nauck contains the trailhead of the 45 miles (72 km)-long Washington & Old Dominion Railroad Trail (W&OD Trail), which follows Four Mile Run through Arlington County as it travels northwest to the town of Purcellville in Loudoun County, Virginia. The trail is within NOVA Parks' Washington & Old Dominion Railroad Regional Park. Nauck is home to Drew Model Elementary School, an Arlington Public Schools Montessori school. As of the 2010 Census, Nauck's population was 35.9% non-Hispanic Black or African-American, 27.3% non-Hispanic White and 25.7% Hispanic or Latino. ^ a b c d e f g h i j k Northern Virginia Regional Park Authority historical marker at trailhead of W&OD Trail in Prats, J.J. (ed.). ""Nauck: A Neighborhood History" marker". HMdb.org: The Historical Marker Database. Archived from the original on 2017-05-29. Retrieved 2018-12-24. 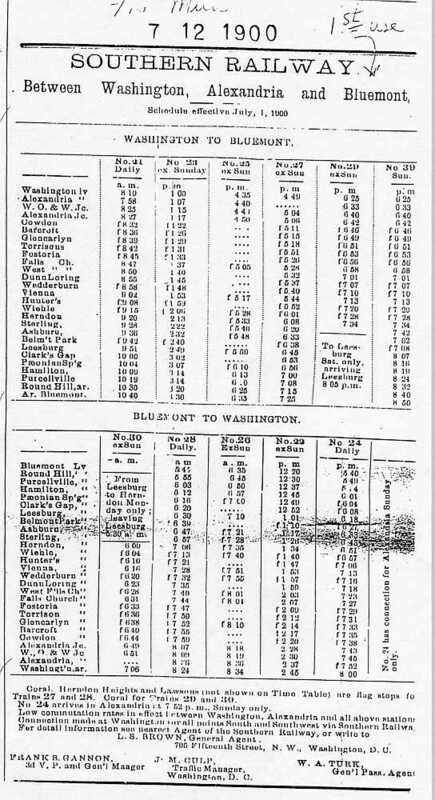 ^ a b (1) Timetable: "Southern Railway: Between Washington, Alexandria and Bluemont: Schedule effective July 1, 1900". Town of Round Hill, Virginia, government. July 12, 1900. Archived from the original on 2002-11-16. Retrieved 2012-11-22. ^ Harwood, pp. 76, 106. ^ a b c Baynard, Kristie, EHT Traceries, Inc. (April 2003). "National Register of Historic Places Inventory Registration Form: Lomax African Methodist Episcopal Zion Church" (PDF). Arlington County, Virginia, government. ^ Merriken, John E. (1987). Old Dominion Trolley Too: A History of the Mount Vernon Line. ISBN 0-9600938-2-6. OCLC 17605355. ^ (1) Bestebreurtje, Lindsey. "Paul Dunbar Homes". Built By the People Themselves. Retrieved 2019-01-17. ^ (1) "Green Valley Pharmacy". Projects and Planning. Arlington County government. 2015. Archived from the original on 2015-05-11. Retrieved 2015-05-28. (2) Liccese-Torres, Cynthia (October 2012). "Green Valley Pharmacy" (PDF). Arlington County Local Historic District Designation Form. Arlington County, Virginia, government. Archived from the original (PDF) on 2016-04-10. Retrieved 2018-12-28. (2) Roberto (photographer) (December 2018). "Green Valley Pharmacy Historical Marker" (photograph). Retrieved 2018-12-25 – via Google. ^ "Fort Barnard Park". Parks & Recreation. Arlington County, Virginia, government. Archived from the original on 2016-11-10. Retrieved December 27, 2018. ^ (1) Michael, John (2011-03-06). "Fort Cass Virginia: The Fortification Begins". Images of America: Fort Myer. Retrieved 2018-12-28. After the fall of Fort Sumter, South Carolina to the Confederates, it was decided that the Nation’s Capital was in need of defenses. Among the first fortifications were built were the ones at the three crossings of the Potomac River – Chain Bridge (Fort Ethan Allen), Aqueduct Bridge (Fort Corcoran) and Long Bridge (Fort Jackson). Over time the Arlington Line of fortifications developed beginning at the Potomac and encircling the western side of the Capital on the Virginia side. (2) "The Arlington Line". Arlington County, Virginia: Arlington Historical Society. Archived from the original on 2012-04-20. (3) Cooling III, Benjamin Franklin; Owen II, Walton H. (2010). The Arlington Lines. Mr. Lincoln's Forts: A Guide to the Civil War Defenses of Washington (New ed.). Lanham, Maryland: Scarecrow Press. p. 82. ISBN 978-0-8108-6307-1. LCCN 2009018392. OCLC 665840182. Archived from the original on 2018-12-28. Retrieved 2018-03-05 – via Google Books. ^ "Fort Barnard Heights Park". Parks & Recreation. Arlington County, Virginia, government. Archived from the original on 2015-07-31. Retrieved December 27, 2018. (3) Meyer, Roger Dean (photographer) (September 9, 2007). "Three Markers at the Washington & Old Dominion Trailhead" (photograph). Washington and Old Dominion Trail. HMdb: The Historical Marker Database. Retrieved December 25, 2018. 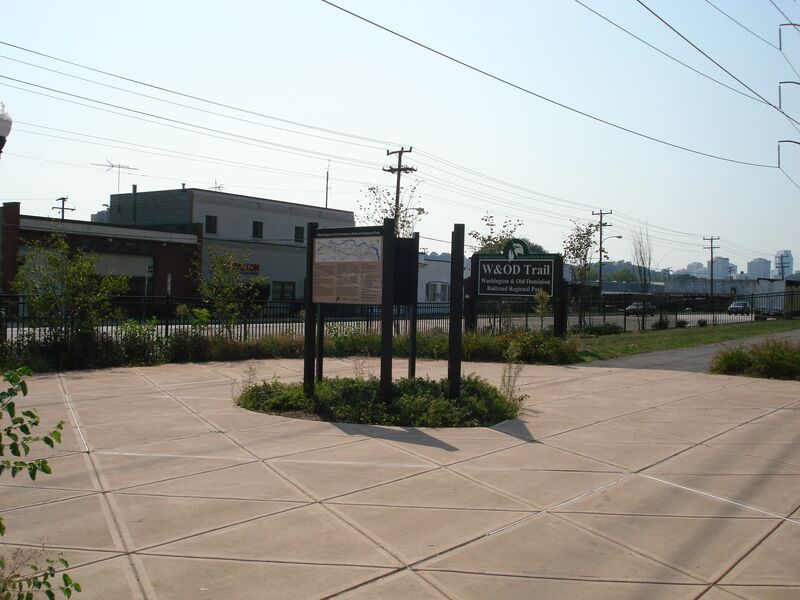 The three markers include Nauck: A Neighborhood History, Tracks Into History and Washington and Old Dominion Railroad Trail. Harwood, Herbert Hawley, Jr. (2000). Rails to the Blue Ridge: The Washington and Old Dominion Railroad, 1847–1968 (3rd ed.). Fairfax Station, Virginia: Northern Virginia Regional Park Authority. ISBN 0615114539. OCLC 44685168 – via Google Books. Bestebreurtje, Lindsey (2017). "Built By the People Themselves — African American Community Development in Arlington, Virginia, From the Civil War Through Civil Rights" (PDF). A Dissertation Submitted to the Graduate Faculty of George Mason University in Partial Fulfillment of The Requirements for the Degree of Doctor of Philosophy: History. Fairfax County, Virginia: George Mason University. Retrieved 2019-01-17. Williams, Talmadge T. "Nauck" (PDF). African American History in Arlington Virginia: A Guide to the Historic Sites of a Long and Proud Heritage. Arlington County, Virginia: Arlington Convention and Visitors Service. Archived from the original (PDF) on 2014-04-21.